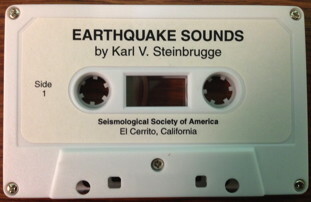 This collection of 21 earthquake-related sounds, prepared by Karl V. Steinbrugge, was originally published in BSSA vol. 64, no. 5 in 1974 and updated with eight additional sounds in 1985. The collection was sold by the Society for many years, first as an audio cassette tape and later as a compact disc. SSA is now making it available for free in the form of digital audio files in MP3 format. You can listen to individual sounds below by clicking the play button in the audio player next to the recording number. To download MP3 audio files of all the sounds as a Zip archive (which also includes a PDF of the data on this page) click here [Zip Archive; 56.2 MB]. Recording #1: Sorry. Your web browser doesn’t support the html5 audio tag. Location and/or name: 1954 Eureka, California earthquake Date and time: 21 December 1954, 11:56:25 a.m. PST Epicenter: 40°49’N, 124°05’W Magnitude: 6.6 Modified Mercalli intensity (MMI) at site: VII Literature: “An Engineering Study of the Eureka, California, Earthquake of December 21, 1954”, Karl V. Steinbrugge and Donald F. Moran, Bulletin of the Seismological Society of America 47, 129–153, plus maps (1957). Commentary: The recording was made in a two-story wood-frame building. The sounds probably are a mixture of those originating from the soil and also from the vibrating building. The abrupt termination is due to power failure throughout the Eureka area. The voices are those of Mr. Ervin Hadley’s niece and her young son. Acknowledgments: Mr. Ervin A. Hadley of Eureka, California gave this recording to Mr. Frank E. McClure, who in turn made a copy for Mr. William K. Cloud; the latter recording was used for the 1974 cassette, while the McClure original was used for the 1985 cassette. Recording #2: Sorry. Your web browser doesn’t support the html5 audio tag. Location and/or name: 1957 San Francisco earthquake Date and time: 22 March 1957, 11:44:21.0 a.m. PST Epicenter: 37°40’N, 122°29’W Magnitude: 5.3 MMI at site: VI Literature: “San Francisco Earthquake of March 1957”, a collection of papers edited by Gordon B. Oakeshott, in California Division of Mines Special Report 57, 127 pp. (1959). Commentary: Approximately 700 students were in the auditorium of Sequoia High School when the earthquake struck. Although the quality of the recording is excellent, no sounds other than the audience’s reactions appear to be present. Careful listening will reveal that at least one person voiced alarm 3 seconds before the rest of the audience also reacted. The significance of this recording, however, is in the potential for panic from this mild shaking which did not damage the building. Acknowledgments: Reproduction permission was granted by Mr. Richard C. Genasci (Principal), Sequoia High School, Redwood City, California. Recording #3: Sorry. Your web browser doesn’t support the html5 audio tag. Commentary: A telephone conversation was being recorded in an outdoor telephone booth in downtown San Francisco when the earthquake occurred. The telephone and the recording equipment remained operational during the earthquake. Prior to the event, street noises, such as the movement of heavy trucks and buses, can be heard. The recorded voices and sounds are those within the phone booth as well as those from the other end of the line; the other end was located perhaps 3 to 5 miles westerly of the downtown recording location and also was possibly that much closer to the earthquake. Acknowledgments: Mr. Ed Arnow of KPIX Television, San Francisco, supplied the original recording and background information. Recording #4: Sorry. Your web browser doesn’t support the html5 audio tag. Location and/or name: Sikeston, Missouri Date and time: 3 March 1963, 11:30:13.0 a.m. CST Epicenter: 36.7°N, 90.1°W Magnitude: 4.5 MMI at site: V or VI Literature: U.S. Earthquakes, 1964, Carl A. von Hake and William K. Cloud, Environmental Sciences Services Administration, 69 pp. (1965). Commentary: Excerpt from a taped sermon by Dr. J. Lester McGee in the First Methodist Church in Sikeston. This excerpt was used in a news broadcast on station KSIM. Acknowledgments: Permission to reproduce the recording was granted by Merlin G. Hagy, Program Director of KSIM Radio of Sikeston, Missouri. The author is grateful to Father William Stauder, S.J., of Saint Louis University, who materially aided in obtaining the recording for the author. Recording #5: Sorry. Your web browser doesn’t support the html5 audio tag. Location and/or name: 1964 Alaska earthquake (also referred to as the “Good Friday earthquake” and “Prince William Sound earthquake” Date and time: 27 March 1964, 5:36:13.0 p.m. AST Epicenter: 61.0°N, 147.8°W Magnitude: 8.4 MMI at site: VIII (?) Literature: Voluminous literature, but papers having particular relevant to the recording are: “Introduction to the Earthquake Engineering of the 1964 Prince William Sound, Alaska, Earthquake”, Karl V. Steinbrugge, in The Prince William Sound Earthquake of 1964 and Aftershocks, Volume II Part A, Environmental Sciences Services Administration (1967). See pp. 4–5 and 13–14. “Seismological Background for Engineering Studies of the Earthquake”, Donald F. Hudson and William K. Cloud, in The Great Alaska Earthquake of 1964: Engineering, National Academy of Sciences (1973). See particularly pp. 32–32. Location of recording: Blueberry Road near the northeast corner of Northern Lights Boulevard, Anchorage, Alaska Previous publication: Earthquake, Alaska, 7″, 33.3 rpm record, produced by Bob Pate, Alaskan Artifacts Enterprise. The Prince William Sound, Alaska, Earthquake of 1964 and Aftershocks, 7″, 33.3 rpm record on flexible vinyl, included as an appendix in a pocket in the rear of Volume II Part A of the publication of the same name (see “Literature”, above). Commentary: The recording was made by Mr. Robert A. Pate in his small one-story wood-frame dwelling in a region where no landsliding or other geological effects were present. Within 5 seconds, at most, after Mr. Pate felt the earthquake, he began dictating his thoughts and reactions into the recorder. About 1 minute after the start of the earthquake, Mr. Pate stated that the earthquake had not shown signs of stopping yet. Shortly thereafter he stated that he was going to put the television set on the floor; he had to crawl because he could not walk. About 1 minute and 10 seconds after the start of the recording, Mr. Pate stated that the house was still shaking so much that he wondered if he shouldn’t go outside. One and one-half minutes after the recording began, the noise level substantially decreased; at that time Mr. Pate seemed to sense that the worst was over. Three minutes after the start, he positively stated that the ground was still shaking, but it seems from his attitude that the shaking had greatly diminished. The dwelling was undamaged, and only three or four dishes fell from kitchen cabinets, although the doors had swung open. Acknowledgments: Mr. Robert Pate of radio station KHAR supplied a copy of the recording plus background information. Recording #6: Sorry. Your web browser doesn’t support the html5 audio tag. Location of recording: 801-05 NW Fourth Avenue, corner H Street, Anchorage, Alaska Previous publication: Actual Sounds of the Alaskan Earthquake, March 27, 1964, 7″, 45 rpm record, by Quakesound Records of Anchorage, Alaska. Commentary: Two attorneys (David H. Thompson and Howard Pollock), a pathologist (Dr. Fred Strauss), and a court reporter (Margo Britch) were taping a deposition when the earthquake occurred. Their comments were recorded on a portable tape recorder, which operated until the power failed. This recording covers the beginning of the shock, which is lacking in the tape for Recording 5. The recording was made in the second story of a two-story wood-frame structure which survived the earthquake. Acknowledgments: Information on the recording was provided through the courtesy of David H. Thompson and Margo Britch. Recording #7: Sorry. Your web browser doesn’t support the html5 audio tag. Location and/or name: 1965 Puget Sound, Washington earthquake Date and time: 29 April 1965, 8:28:46.6 a.m. PST Epicenter: 47.4°N, 122.3°W Magnitude: 6.5 MMI at site: VII Literature: The Puget Sound, Washington Earthquake of April 29, 1965, S. T. Algermissen, S. T. Harding, K. V. Steinbrugge, and W. K. Cloud, U.S. Coast and Geodetic Survey, 51 pp. (1965). Commentary: The recording was made in the language laboratory of a one-story hollow concrete block structure which apparently suffered little if any building damage. The location of Kent Junior High School is approximately at the earthquake’s epicenter. Acknowledgments: Mr. John Meehan of the State of California’s Office of Architecture and Construction obtained a tape from Kent Junior High School, and Mr. Meehan provided it to the author. Recording #8: Sorry. Your web browser doesn’t support the html5 audio tag. Location of recording: Band room, Puyallup Senior High School, Puyallup, Washington Previous publication: Earthquake, an Exclusive Recording by Puyallup Hi School, 7″, 45 rpm record. Commentary: The recording took place on the third floor of the school, where a band member was recording his music when the earthquake occurred. The earthquake sounds are mixed with a cymbal falling to the floor, then mixed with band risers falling from storage, then mixed with the students leaving the building. The school’s fire bell finally rings. The original taping continued (but is not here reproduced) until some students finally returned. Acknowledgments: Permission to reproduce this recording was granted by Mr. Richard Graham (Band Director) and Mr. Randolph H. Hathaway (Principal) of Puyallup Senior High School. Recording #9: Sorry. Your web browser doesn’t support the html5 audio tag. Location and/or name: 1967 Caracas, Venezuela earthquake Date and time: 29 July 1967, 8:59:58.7 p.m. local time Epicenter: 10.5°N, 67.3°W Magnitude: 6.3 MMI at site: VI (?) Literature (selected): A Study of Soil Amplification Factors in Earthquake Damage Areas, Caracas, Venezuela, A. F. Espinosa and S. T. Algermissen, with appendices by Karl V. Steinbrugge and Lloyd S. Cluff, NOAA Technical Report ERL 280-ESL 31, National Oceanic and Atmospheric Administration (1972). The Venezuela Earthquake, Robert D. Hanson and Henry J. Degenkolb, American Iron and Steel Institute (1969). Location of recording: Caracas, Venezuela Previous publication: El Terremoto de Caracas, 7″, 45 rpm record by Fábrica Venezolana de Discos, C.A. Commentary: A recording session was in progress at a recording studio when the earthquake occurred. Although the technician left, power did not fail and the equipment continued to operate. The rerecorded music has the earthquake sounds superimposed on it. Acknowledgments: Professor Alberto E. Olivares materially assisted in making the necessary arrangements with Sr. Jorge Ramirez of Fábrica Venezolana de Discos for releasing the recording for publication. Recording #10: Sorry. Your web browser doesn’t support the html5 audio tag. Location and/or name: 1969 Santa Rosa, California earthquake Date and time: 1 October 1969, 9:56:46.5 p.m. PDT (first shock); 11:19:57.1 p.m. PDT (second shock) Epicenter: 38°28.0’N, 122°41.5’W (first shock); 38°27.3’N, 122°41.5’W (second shock) Magnitude: 5.6, 5.7 MMI at site: VII to VIII Literature: The Santa Rosa, California, Earthquakes of October 1, 1969, Karl V. Steinbrugge, William K. Cloud, and Nina H. Scott, Environmental Sciences Services Administration, 99 pp. (1970). Commentary: No earthquake sounds are present, and only the duration of the shaking (11 seconds plus) can be detected because the recording was a direct electronic transcription from a long-playing disc to a tape recorder. No outside noise was picked up except for turntable tone-arm vibrations. Acknowledgments: Mr. Robert A. Olson, with the (then) U.S. Office of Emergency Preparedness, obtained this recording from Mr. Richard Van Cleave, who made the original recording. Recording #11: Sorry. Your web browser doesn’t support the html5 audio tag. Commentary: The audio portion of a television program was being recorded when the earthquake occurred. Interruptions on the tape reflect intermittent electric power outages in the regular power supply, with the tape recorder automatically switching to internal batteries to compensate. Within the house, there was spillage from cupboards, breakage of glass, and water spillage due to sloshing from a 55-gallon aquarium. The duration of the heaviest shaking on this high and firm ground location appears to be substantially less than that on the weaker soils in low ground locations. Acknowledgments: Mr. Robert A. Olson, with the (then) U.S. Office of Emergency Preparedness, obtained this recording from Mr. David Sepulveda, who recorded the original. Recording #12: Sorry. Your web browser doesn’t support the html5 audio tag. Commentary: This is a recording of a committee meeting in progress at the time of the earthquake. Acknowledgments: Mr. Robert A. Olson, with the (then) U.S. Office of Emergency Preparedness, obtained this recording from Mr. Clinton Smith, who owned the original. Recording #13: Sorry. Your web browser doesn’t support the html5 audio tag. Commentary: The recording was made with the recorder on the floor of a frame dwelling. The microphone was on a small table along with a radio receiver tuned to the local police frequency. A standard broadcast radio was operating approximately 6 feet from the microphone. Family sounds are heard immediately after the recording of the 11:20 p.m. shock. Acknowledgments: Mr. Robert A. Olson, with the (then) U.S. Office of Emergency Preparedness, obtained this recording from Joseph H. Apfel, Ph.D., who owned the original. Recording #14: Sorry. Your web browser doesn’t support the html5 audio tag. Location and/or name: Aftershock of the 1975 Oroville, California earthquake Date and time: Mainshock, 1 August 1975, 1:20:13 p.m. PDT; this aftershock, 2 August 1975, 6:03:06 p.m. PDT Epicenter: Mainshock 39°26.33’N, 121°31.71’W; this aftershock 39°29.26’N, 121°31.06’W Magnitude: Mainshock, 5.7; this aftershock, 4.6 MMI at site (this aftershock): V to VI Literature: Newsletter of the Earthquake Engineering Research Institute 9(5B) (July 1975). “Oroville, California, Earthquake [of] 1 August 1975”, R. W. Sherburne and C. J. Hauge (editors), in Special Report 124, California Division of Mines and Geology, 151 pp. (1975). Commentary: Mr. Frank McClure was participating in and recording a meeting held in the one-story Oroville City Hall when the aftershock occurred. In attendance were eleven persons, including city officials and consulting engineers. According to Mr. George Barr (Building Official), the city hall was undamaged in both the mainshock and this aftershock; the construction was a wood roof, concrete floor slab on grade, and poured-in-place exterior walls. Acknowledgments: Mr. Frank E. McClure made the original of his recording available and supplied the author with most of the information. Recording #15: Sorry. Your web browser doesn’t support the html5 audio tag. Location and/or name: Aftershock of the 1975 Oroville, California earthquake Date and time: This aftershock, 27 September 1975, 3:34:37.7 p.m. PDT Epicenter: This aftershock, 39°30.9’N, 121°34.2’W Magnitude: Mainshock, 5.7; this aftershock, 4.6 MMI at site (this aftershock): IV to V Literature: See recording 14. Commentary: Announcer Mr. Jim Ragland was describing the closing moments of a junior college football game between Butte and Saddleback. An estimated 775 persons were in the audience, mostly seated on portable-type bleachers. There was no spectator panic, although a few screams are heard. The game was almost complete, and the official timekeeper let the time run out, concluding the game. Acknowledgments: The original of this recording was given to the author by KORV/Radio 1340 of Oroville, California. In this regard, the assistance of Mr. James H. Moll (News Director) and Mr. Jim Ragland (announcer) is gratefully acknowledged. Recording #16: Sorry. Your web browser doesn’t support the html5 audio tag. Location and/or name: Friuli, Italy Date and time: 6 May 1976, 8:00:15 p.m. local time Epicenter: 46°09’N, 13°06’E Magnitude: 6.2 to 6.5 MMI at site: Not determined, but see “Commentary” Literature: The Gemona di Friuli Earthquake of 6 May 1976, P. Pichard, N. N. Ambraseys, and G. N. Ziogas, UNESCO (1976). “The Earthquake in Friuli, May 6, 1976”, A. Parducci et al., in L’Industria Italiana del Cemento (August 1976). Editions in Italian and English. Contribution to the Study of Friuli Earthquake of May 1976, M. Mittempergher et al., Commission on Seismic Problems Associated with the Installation of Nuclear Plants (1976). Editions in Italian and English. Commentary: The building in which the recording was made suffered some damage. Acknowledgments: Through the good offices of Mr. James L. Stratta, Mr. Izi Benini of radio station RA 1 of Udine, Italy provided a copy of the tape and background information. Recording #17: Sorry. Your web browser doesn’t support the html5 audio tag. Location and/or name: Willits, California Date and time: 22 November 1977, 1:15:52.5 p.m. PST Epicenter: 39°26.8’N, 123°15.6’W Magnitude: 4.8 MMI at site: VII to VIII Literature: “Staff Report: Willits Earthquake”, Richard R. Buck and John D. MacLeod (staff, California Seismic Safety Commission), in Newsletter of the Earthquake Engineering Research Institute 12(3) (May 1978). Commentary: Two very similar recordings were made on tape recorders located in two adjacent rooms (Music Band Room and Practice Room). This recording is from that in the Band Room. Sounds are from band instruments falling. The school was a one-story wood-frame constructed in 1958. Acknowledgments: Mr. Kenneth Howell, Instrumental Music Director at Willits High School, kindly made his original recordings available. We also thank Mr. Charles Davison (Principal) and Mr. Ernest Carlson (Vice Principal), who assisted in developing the needed information. Recording #18: Sorry. Your web browser doesn’t support the html5 audio tag. Location and/or name: El Centro, California (Imperial Valley earthquake) Date and time: 15 October 1979, 4:16:54.5 p.m. PDT Epicenter: 32.63°N, 115.33°W Magnitude: 6.6 MMI at site: Not established Literature: The Imperial Valley, California, Earthquake of October 15, 1979, USGS Professional Paper 1254, 2 volumes, 451 pp. plus 4 plates (1982). Acknowledgments: Recording courtesy of Mr. Robert Avalos of El Centro. Recording #19: Sorry. Your web browser doesn’t support the html5 audio tag. Commentary: An excellent recording of the response of the fire department and other emergency services. Acknowledgments: The original tape was made available through the courtesy of Fire Chief T. H. Garner of the El Centro Fire Department. Recording #20: Sorry. Your web browser doesn’t support the html5 audio tag. Location and/or name: Coalinga, California Date and time: 2 May 1983, 4:42:37.8 p.m. PDT Epicenter: 36°13.99’N, 120°17.59’W Magnitude: 6.7 MMI at site: VIII Literature: “The 1983 Coalinga, California Earthquake”, a collection of papers edited by John H. Bennett and Roger W. Sherbourne, in California Division of Mines and Geology Special Publication 66. The Coalinga, California, Earthquake of May 2, 1983: Reconnaissance Report, a collection of papers edited by Roger E. Scholl and James L. Stratta, Earthquake Engineering Research Institute Report No. 84-03. Commentary: Recording equipment was not in the best working order at time of the earthquake, and the quality of the recording is poor. A carefully prepared transcript of more than 7 hours of the recording exists at the Coalinga Fire Department, however. The earthquake epicenter was located about 6 miles northerly of the city. Acknowledgments: The tape recording was provided through the courtesy of Fire Chief Fred R. Frederickson of the Coalinga Fire Department. Recording #21: Sorry. Your web browser doesn’t support the html5 audio tag. Location of recording: An oil storage yard in Niigata which was about 250 km from the epicenter. Previous publication: None known. Commentary: Effects of oil oscillation were observed on about ten tanks, and the maximum wave height exceeded 5 meters. The recording begins immediately after the start of the oil oscillation. The noise created by the oscillating oil follows and is described as sea waves striking the beach. The sound is similar to a drum beat whenever the floating roof hits the tank well. Since the recording was made on a microcassette in a person’s pocket, the noises include friction between the microphone and clothing. Acknowledgments: The kindness of Professor Heki Shibata of the Institute of Industrial Science, University of Tokyo, was most helpful in providing the tape recording and the descriptive text.